The stiff white polypropylene brush is designed for heavy growth below the waterline, ground in dirt and for use with solvents. 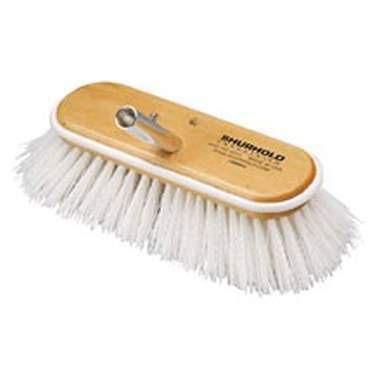 07042 10 inch (25cm) Large Stiff White Brush (990) Shurhold brushes feature a hard wooden base, premium quality bristles, rust proof nickel-silver stapling wire and a wrap around safety bumper. Shurhold s exclusive SHUR-LOCK quick release system locks any Shurhold handle quickly and easily with all Shurhold accessories.